Have you ever had something at home just laying around that you never threw out because you knew that, "someday" you were going to use it for, 'something'?..I'm sure most of you have such an item or more than one item... I know I have quite a few.. This morning as I was cleaning my bathroom which by the way, I detest doing. I don't mind cleaning my house but thats the one job out of all of them I abhor the most but, it's a necessary evil. Back to my original thought. As I was cleaning the bathroom I was looking at my shower doors. For a long time I just had a simple curtain up that you could close and you couldn't see the doors anymore.. It was rather plain but it served it's purpose. This morning I found an old pair of curtains I have had for what seems like eons. I like the design but they don't match my bedroom decor so I stashed them away. 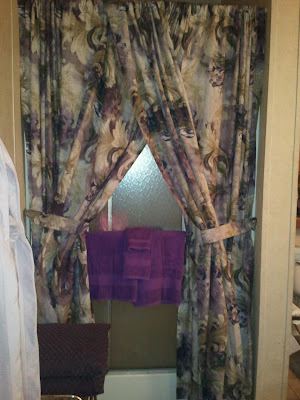 I pulled them out this morning and decided to give my shower doors in my master bath a makeover and this is what I came up with.. I like how it looks....for now anyway. Maybe my readers can help me here. 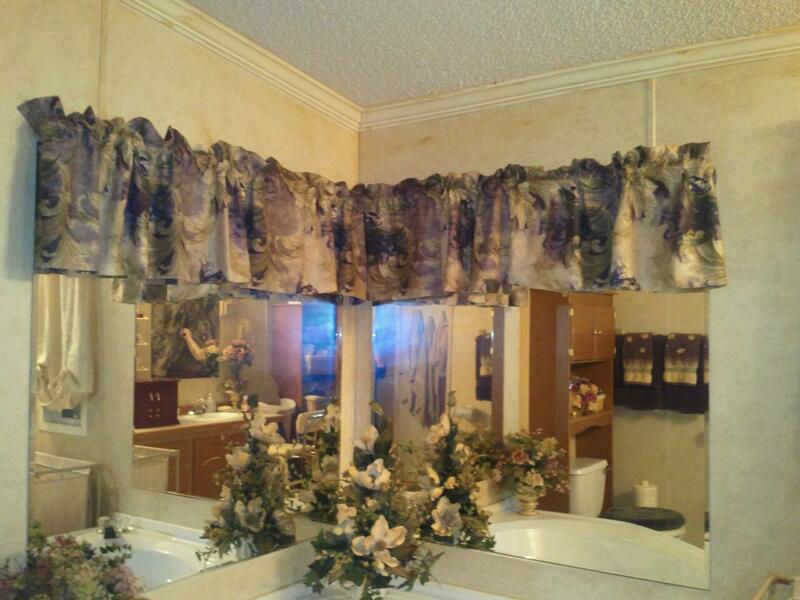 You see above the valances on the mirrors? You see that yellow color? Okay, well that is some kind of glue that the builders had used when they built my house and I have tried everything other than taring the wall down to get it off.. Any suggestions out there from any of you DIY divas? I hope you enjoyed my small recycled bathroom makeover.. What have you used that you already had on hand to re purpose something in your home? 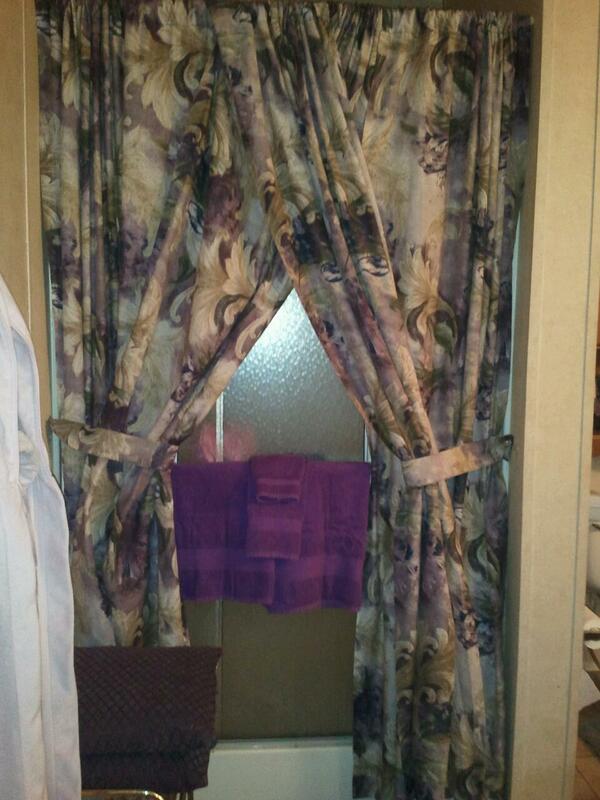 I like the look of the curtains--it dresses it up. You might try goo gone on the walls. It is used to remove glue and I have used it on flooring and cement before and it does a good job. You would have to look it up--try googling it to see if you can use it on walls. I bought mine years ago at a hardware store and I think most places sell it. Or you could do a stippling type of painting on the walls, but I don't usually like how this turns out! I think it looks beautiful. Better than my shower but then again I could put my shower in yours and still be able to walk around. I always clean the bathroom and my wife cleans the house. I do the bathroom the laundry and the dishes. Fair trade for me. Well bathroom looks great I love it. I love how everything turned out! Great way to reuse an old thing. Now about that glue that is a hard one. We have that too. I don't know any other way to get rid of it than by painting over. Let me know if someone else tells you different. We have it in our house too. WELL, IT'S MOLLY. LOL GOOD JOB, ROBBY, ON THE BATHROOM REPURPOSING. ABOUT THE GLUE ABOVE THE VALANCE, GO TO DIY.COM OR GOOGLE "PAINTING OVER GLUE ON WALLS". I'M SURE THERE'S SOMETHING YOU CAN DO...MAYBE EVEN A WALLPAPER? I'VE REPURPOSED SO MANY THINGS...OLD BASEBOARDS, CHAIR RAILS, CURTAINS, LAMINATE FLOORING, A TOP FOR MY KITCHEN ISLAND FROM AN ENTERTAINMENT CENTER THAT WAS FALLING APART. I'M THE QUEEN OF REPURPOSING. LOL OH AND I ALSO TEAR OLD T-SHIRTS AND FLANNEL SHEETS INTO DUSTING/CLEANING CLOTHS AND OLD PLASTIC TABLECLOTHS OR SHOWER CURTAINS INTO DROP CLOTHS WHEN PAINTING.